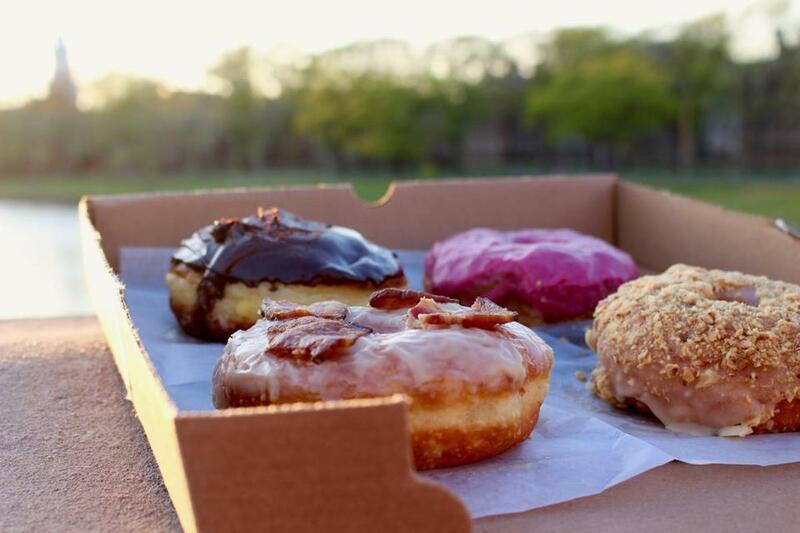 Connor Schoen and Tony Shu&apos;s donut shop will feature food from several wholesale providers including Union Square Donuts. As volunteers at a youth shelter in Harvard Square, Tony Shu and Connor Schoen saw firsthand how homeless people can struggle to find work, trapping them in a vicious cycle. “We both found that in our conversations with some of the guests, one of the issues that came up very often was the difficulty finding work and, beyond that, the difficulty of maintaining a job,” Shu said. Now, the two rising sophomores at Harvard University are seeking to confront the problem at its source, crafting plans for a doughnut shop and cafe that wouldemploy young adults who are homeless. They would work alongside local students in an effort to reintegrate them into the workforce. Shu and Schoen say the cafe, which will be called Breaktime, will team up with nonprofit organizations to hire workers who have remained homeless despite having a foundation of vocational training. The cafe will be near Harvard Square. The address will be announced this summer. The cafe is currently looking to hire young adults, ages 18 to 24, with about six to 12 months of vocational training. More than 6,100 homeless individuals live in Boston, according to the US Department of Housing and Urban Development’s 2017 Annual Homeless Assessment Report. Of that number, 190 were unaccompanied homeless youth, defined as children and young adults under age 25. Shu said he and Schoen were inspired by other food businesses with similar hiring practices, but wanted to tweak their approach. They decided to purchase food wholesale from businesses such as Union Square Donuts to reduce costs, but plan to make their own coffee. As part of their plan to help homeless young adults “toward a more stable career,” Shu and Schoen plan to assign each employee a career mentor. Workers would initially be hired for one-year stints. After that, they would either move on to another job or be promoted to a position with more responsibility. Connor Schoen and Tony Shu presented their idea to the Harvard Innovation and Ventures in Education competition. The cafe will be run independently from the university, but organizers plan on tapping Harvard staff and alumni to support the workers. “The heart and core of Breaktime is engaging the community and engaging students and young people and organizations and food businesses — even the government — and coming together to find a longer-term solution to homelessness,” Shu said. Schoen said organizers also plan to use their Harvard connections to build a customer base. Since starting the project six months ago, Schoen said, he and Shu have quickly learned the sacrifices that go along with being full-time students and entrepreneurs. More than 10 other students have joined the Breaktime team to work on marketing, design, and other parts of the project, they said. 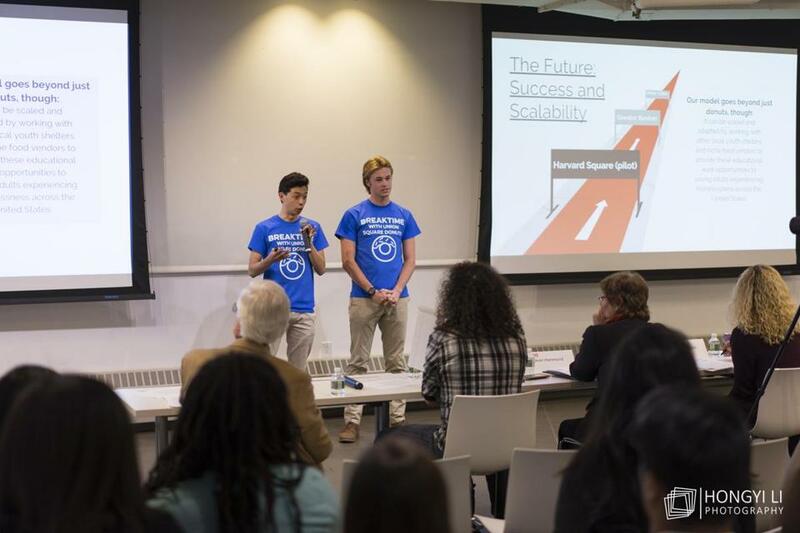 Breaktime won grant money in the 2018 Harvard College Innovation Challenge and the Harvard GSE Innovation and Ventures in Education competition. The students are continuing to raise money online for expenses such as plumbing, seating, and branding. Their GoFundMe campaign had raised $3,925 of its $10,000 goal as of Friday afternoon. If they reach that goal, the cafe could open by mid-September, Shu and Schoen said.